This is useful, because if we can label the coordinates of the atoms in a molecule or crystal then we can easily work out the angles between the bonds. In a perfect tetrahedral molecule there is a central atom attached to four other atoms which lie on the vertices of a perfect tetrahedron. If the central atom is at the coordinate origin and the molecule rests on the plane $z=-h$ then what would be the coordinates of the other atoms, assuming a bond length of $1$ unit? Find the scalar products between the vectors joining the origin to each atom and hence the value of $h$. It is usually stated that the angles each of these bonds make is $109.5^\circ$; however, this is only an approximation. What is the exact value of the bond angle in a perfect tetrahedron? If the perfect tetrahedron is deformed slightly, how many of the bond angles could be exactly $109.5^\circ$? How would it be deformed to achieve this? 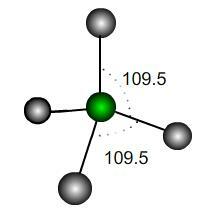 Would the other bond angles increase or decrease under such a deformation? A perfect trigonal pyramidal molecule is the same as a perfect tetrahedral molecule with a single outer atom removed. 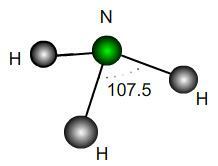 Ammonia NH$_3$ is approximately a trigonal pyramid with bond angle $107.5$. Does this correspond to a lengthening or shortening of the bonds relative to a perfect structure? By what percentage? If the H atoms were fixed and a vertical force were applied downwards to the N atom in the diagram, would the bond angles increase or decrease? What would be the maximum possible angle mathematically? Logarithmic functions. Physics. STEM - physical world. Engineering. Chemistry. Biology. Calculating with ratio & proportion. Scalar products. Vectors. Investigations.